Every. Single. Sunday. About an hour or so before we head out to the market, in complete confusion I ask "Wait... what the heck am I going to eat for lunch this week?". Every time. It's like clock work. Derek laughs at the sheer redundancy of it, and my head starts scratching at the walls for an answer. I'm one of those people who cannot eat the same thing every week. I'm always looking for a new lunch idea... every week. It's a bit much. But hey, keeps it interesting right? We took a trip to our favorite natural food store here in town, Common Crow (hey nice name! ), to browse or as D calls it - have a "museum tour". This place is vegan/dairy-free heaven. If you live in the Cape Ann area and have a dairy allergy or a vegan preference it's so worth checking out. We literally enjoy visiting just for the sake of perusing since it is a little local market instead of a big box store such as Whole Foods. I always end up buying something because finding dairy free items that are usually off limits is like finding gooooooold, I tell you. Gold. Start by seasoning the chicken tenders with the all purpose spice of your choice (I used Riley's All Purpose). Once seasoned, grill the chicken on medium heat until they're crispy, cooked through and have those beautiful grill lines across them. I tend to cook the entire package of chicken the first time I prepare this and refrigerate the rest so that I can quickly assemble my lunch in the morning the rest of the week. Chop the chicken into bite size pieces. 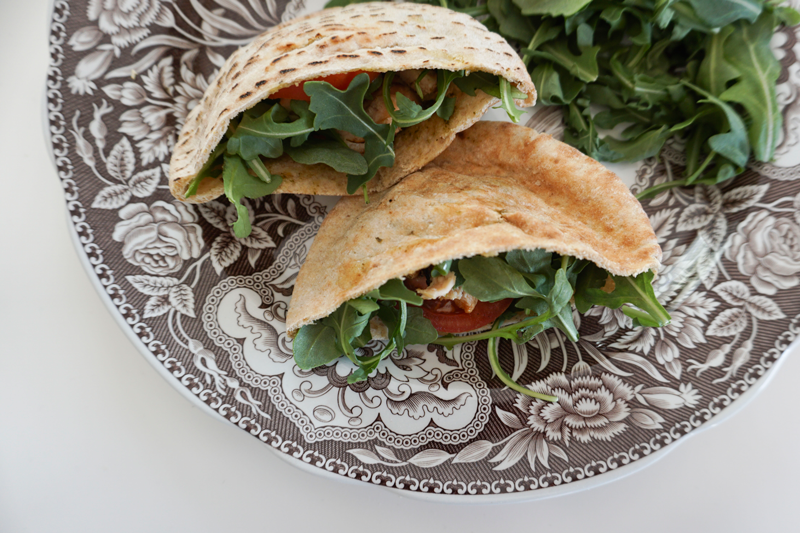 Next, slice the pitas in half to create two pockets. Spread about a tablespoon of pesto in each pocket. 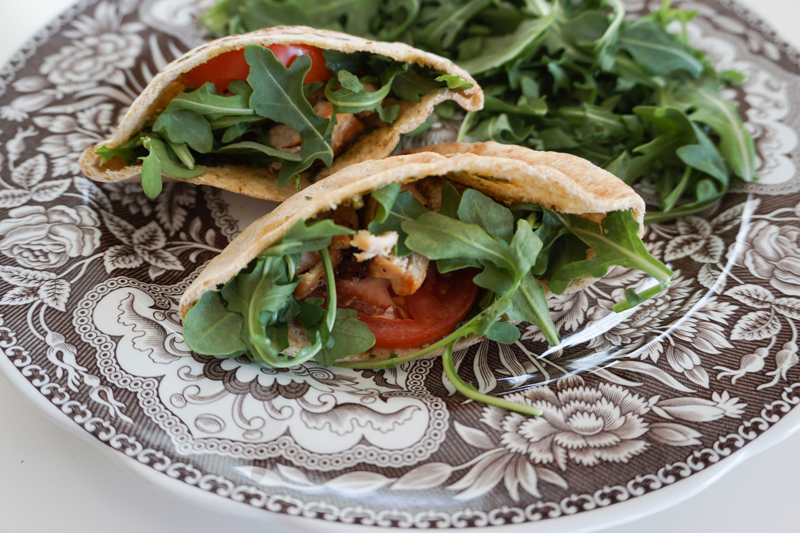 Fill the pita with a handful of arugula, sliced tomatoes and the chopped chicken. Serve warm immediately or cold throughout the week - either way, it's delicious. And that simple. What are you favorite lunch recipes? Please share them in the comments below! I'm in need of ideas. Always.